The Mountain Chalet is one of the few remaining old-time ski lodges in Aspen. We proudly offer a comfortable visit at a good value. Since 1954 when Ralph Melville opened his dream lodge right downtown between the two ski lifts, the Melville family has happily served Aspen visitors. Indeed, when you stay with us, you will likely meet his wife Marian and probably some of their many children, grandchildren, or dogs (unfortunately, Ralph is no longer with us). In contrast with Aspen’s elite properties, the owners and staff of the Mountain Chalet focus on a casual, friendly environment which allows guests to interact with each other in our cozy lobby and at our breakfast joiner tables. Our extensive amenities, central location, and comfortable beds will make your stay very enjoyable. We gladly serve the budget-minded traveler as well as those preferring nicer accommodations in a family-style hotel. We think you’ll have a great stay! 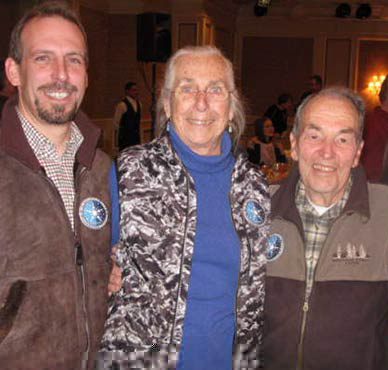 Ralph and Marian Melville with their son Craig at the ACRA WinterSkol Luncheon at the St. Regis. Ralph and Marian were named King and Queen of WinterSkol 09. 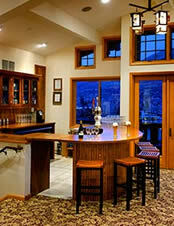 They’ve owned and operated the Mountain Chalet Lodge in Aspen since the 50’s. Photo courtesy AspenSpin.com.